NOTE: This is a live-blog article in which updates are being made in real-time as information comes in. To read this in chronological order, read from the bottom up. 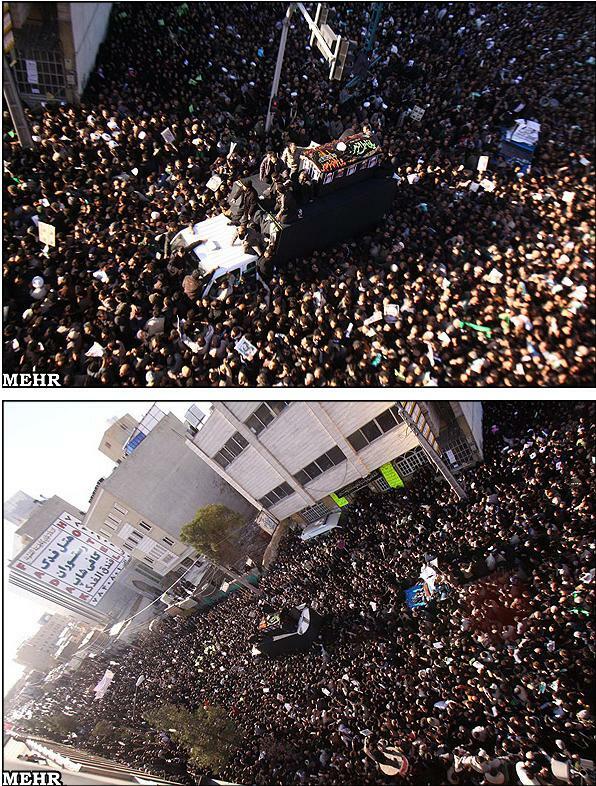 The first three videos of mourners in Qom. Anti-government chants can be heard. One chant, “He who was the cheater, ripped the picture!” They are basically saying that the government that cheated in the presidential election is responsible for ripping Khomeini’s picture–a swipe at the regime after state media showed an image of Ayatollah Khomeini being torn (a taboo in Iran) and tried to blame it on opposition protesters. 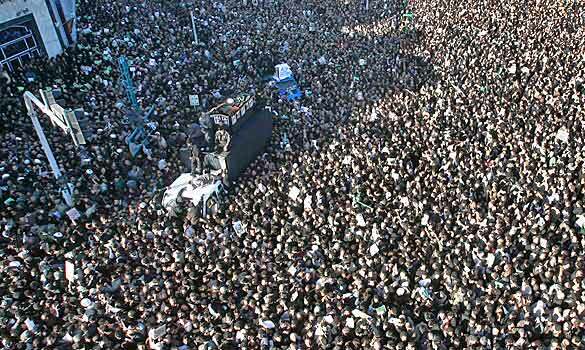 Live-blog of Montazeri Day of Mourning in Qom. By test, Ayatollah Khamenei was referring to the incident that resulted in the removal of Ayatollah Montazeri from his position as the successor to Ayatollah Rouhollah Khomeini and subsequent exile. Montazeri challenged the notion of the Rule of the Just Jurisprudent, which is the foundation of the lifetime rule of one cleric as the Leader of Iran. Unconfirmed reports saying Mousavi has arrived at Montazeri’s home in Qom. 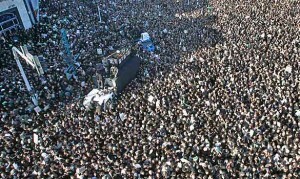 Following the announcements made by a number of Grand Ayatollahs inviting public to mourn the departure of the great shia scholar and noble combatant, Grand Ayatollah Montazeri, in a joint statement Mir Hossein Mousavi and Mehdi Karoubi declared Monday to be a national mourning day and invited the grieving public to at…tend Grand Ayatollah Montazeri’s funeral which will be held tomorrow (Monday Dec 21st). Omid Habibinia reports that demonstations are taking place all over the country. Reports are being made that Iran’s state news agencies are disrespecting Ayatollah Montazeri by not using his title when referring to him. They are basically reporting that he died and that’s it. The regime appears to be attempting to downplay the event, but there are already calls being made for daily mournings every day until Ashura. The situation has the potential to become volatile. Quick Opinion: As I hinted at in my initial report on Montazeri’s death (first entry at the bottom of the page), this does not bode well for the hardline regime in Iran headed by Supreme Leader Khamenei. Khamenei’s complicity (if not downright responsibility) in the Grand Ayatollah’s house-arrest and imprisonment for years, along with the constant stream of government propoganda aimed against him in an attempt to paint Montazeri as an “old fool” is plainly obvious to the majority of the Iranian people. He is known as the insider who tried to confront the excesses of the regime during the tenures of Khomeini as Supreme Leader and Khamenei as President. With six months of continuous pressure from the opposition and the people’s movement (calling itself the green movement) that sprung up and became cohesive during the campaign of presidential candidate Mir Hossein Mousavi (and following the rigged election) the timing could simply not be worse for the regime. Montazeri has died during the third day of Moharram, a time where Shiite Muslims mourn the death by murder of the revered Imam Hossein. 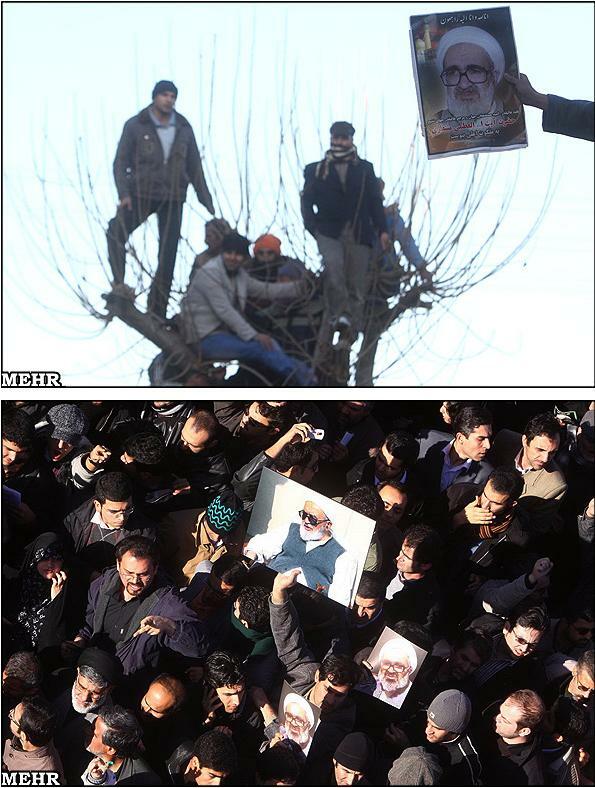 One of the predominant slogans of the the protest movement in the past 6 months has been, “Ya Hossein! Mir Hossein,” a deliberate association of Mir Hossein Mousavi with Imam Hossein (along with all of the connotations that go with the association). Protesters were already planning rallies, expected to be large, for the 10th day of Moharram, called Ashura (on December 27th). Such rallies would already have been difficult to stop or even try to control by the regime because of the signficance of Moharram. It would be a taboo to attack mourners of the revered Imam Hossein. Yet the regime has been making constant threats to the leaders of the movement and their families even as they have attempted to round up student leaders since the Student’s Day protests of December 7th (16th of Azar) and the daily subsequent protests. Green movement supporters were already were reportedly planning to ignore the threats. Khamenei had made similar threats in June, threats which he followed-up on via the unleashing of the Basij, IRGC and mercenary squads on the peaceful protesters. But the protest movement has continued to adapt and show itself to be a strong, difficult to crush force. This has given the movement tremendous momentum, rendering the threats of the government largely ineffective. Now, with the passing of Grand Ayatollah Montazeri, there will almost certainly be many more who will join the ranks of protesters on Ashura–a day which has the potential of dealing a huge blow to the faltering regime. As I stated earlier, the stakes have gone higher (much, much higher). Unconfirmed reports are coming in that many thousands of people are converging on Ayatollah Montazeri’s home in Najafabad. MikVerbrugge reports that opposition leader Mehdi Karoubi is on route to the residence of Ayatollah Montazeri, and may in fact already have arrived. “Montazeri congratulations on your freedom!”, an acknowledgement and show of awareness for his home-imprisonment by the hand regime for years. And, “Montazeri, your path will still be followed!”, meaning they will continue along the path of seeking freedom and justice, which Montazeri criticized the regime for not delivering to the people of Iran. And a picture from the procession at Elm O Sanat University. Zahra Rahnavard زهرا رهنورد According to ParlemanNews a great number of Grand Ayatollah Montazeri’s followers and devotees are moving toward his home in the holy city of Qom to pay their respect. After the announcement of the sad news of Grand Ayatollah Montazeri’s passing, many of his followers and devotees have gathered in his home as well as some of the senior religious figures including Grand Ayatollahs Mousavi-Ardebili, Shobeiri-Zanjani, Bayat-Zanjani, Saanei and Amini. Followers of this senior religious figure are moving toward his home in the holy city of Qom from Tehran, Isfahan, Shiraz, Najaf-Abad and other cities. Grand Ayatollah Montazeri has passed away, according to Iran’s state news agency IRNA. The circumstances surrounding his death are unknown at this time. Ayatollah Montazeri was slated by Ayatollah Khomeini, the founder of the Islamic Republic, to succeed him as Iran’s Supreme Leader, but he had a falling out with Khomeini due the mass execution of dissidents that took place in during the late 80’s, following the Iran-Iraq War. Ayatollah Montazeri was placed under house arrest for years, but because of his religious and revolutionary credentials the regime couldn’t completely silence him. Following the rigged presidential election in June of 2009, Ayatollah Montazeri issued multiple statements in support of the people’s quest to have their rights respected. He was also very critical of the Khamenei/Ahmadinejad/IRGC coup government. Ayatollah Montazeri, the most outspoken critic of the Iranian government condemned what he called the “strategic use” of tearing Ayatollah Khomeini’s picture by the establishment. “By doing this you are defaming him (Ayatollah Khomeini) and saying that people would tear Imam Khomeini’s picture. If anything, you should have kept it silent! “he maintained. Criticizing the regime and also breaking the taboo of mildly criticizing Khomeini in one statement. Considering that Khamenei’s regime is reeling from six months of sustained anti-regime protests, and that they have been issuing numerous shrill threats against Mousavi, Karoubi, Khatami and other leaders of the movement, the timing of Ayatollah Montazeri’s death is very suspect. It is a shame that Ayatollah Montazeri passed without getting to see the realization of a free Iran. I will follow the story closely and report on any developments.